Back To Your Roots … Have you ever thought about visiting Ghana, Africa? Did you know that this was one of the major areas that people were taken from and enslaved during the American slavery period? My wife and I visited and toured Ghana for the purpose of connecting with our roots, as African Americans. It was a once in a life time trip, one that we wish every person could take, especially African Americans. We wrote, Back to Your Roots, to share the experience with especially our church family and our website family. - You will be thrilled by the over 200 pictures. When you purchase the electronic version below, the pictures will be in full color. - You will be fascinated with the commentary that we provide on the various places we went and things we did on our tour. Because we had a personal tour guide and driver for our six nights, we have many detailed experiences to share. Many of the members of our church have commented about how it seems like they have been to Ghana, after reading the book. - You will be challenged to think with us about our lingering issues. We left Ghana thinking about Christianity’s influence on Ghanaians and African Americans. Should African Americans help Ghana, after tribal chiefs sold our fore parents into slavery? What are key differences between declaring your independence and being left alone (i.e., Ghana) verses being declared free with no capital in a capitalistic society (i.e., African Americans)? - Even though you can secure the 139 page black and white paperback version from Amazon.com (click Back To Your Roots: A Reflective Journey To Ghana, Africa to purchase), we think the full color PDF version would be best for those with digital reading devises. And the PDF version is 30% cheaper. 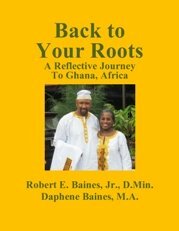 Please click the “Add to Cart” button to purchase your PDF (i.e., portable document format) electronic copy of our book, Back To Your Roots: A Reflective Journey to Ghana, Africa. How does this book relate to the “Christian living” theme of our website? In Mark 12:29-31, we are told that the second greatest commandment is to love our neighbors as we love ourselves. In order to love ourselves, we must know ourselves. For my wife and I, knowing ourselves included going back to Ghana, Africa. For others it may mean going to Ireland or Germany. The more we know and love ourselves, the more we can love our neighbors in healthy ways, and thereby obey the second greatest commandment. Feel free to purchase the black and white paperback version from Amazon.com (click Back To Your Roots: A Reflective Journey To Ghana, Africa to purchase).